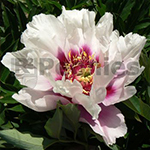 Cora Louise is a beautiful white purple bicolour and semi-double to double Intersectional Hybrid Peony. With the light fragrance is the Cora Louise blooming in the midseason, with flowers up to 20 cm. Cora Louise has a very powerful growth and is blooming very easy. Cora Louise is also after the blooming period a welcome decoration while it stays green till the frost. Beautiful for landscaping in gardens and city parks all over the world.